December 13, 2013 Where in the World is Santa Claus? The latest version of Where in the World is Santa Claus? introduces the app to three new languages: Japanese, Chinese, and Russian. This is the first language update since adding Spanish, German, and French. I guess we just like languages! (We can stop any time we want to.) Thanks to the great professionals on Elance for knocking out those translations. The update also brought new and improved screenshots on the App Store. Actually, just new screenshots, not improved. (What is the opposite of improved?) We added some text to the screenshots, which looks fine when viewed in landscape mode. But it comes out upside-down when rotated for the App Store on the iPhone. Enjoy the goof while it lasts. 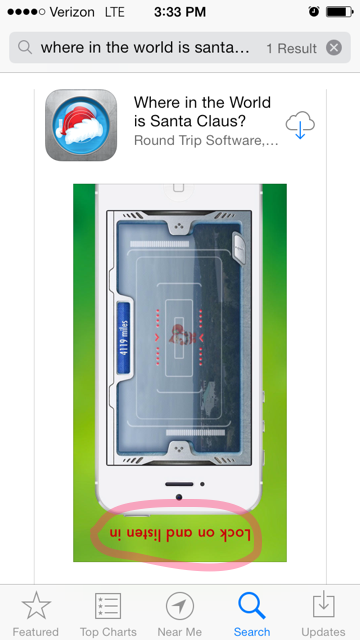 Next we’ll be putting out a small update to the app’s social sharing feature, and with it… right-side-up screenshots. Anything look off to you?